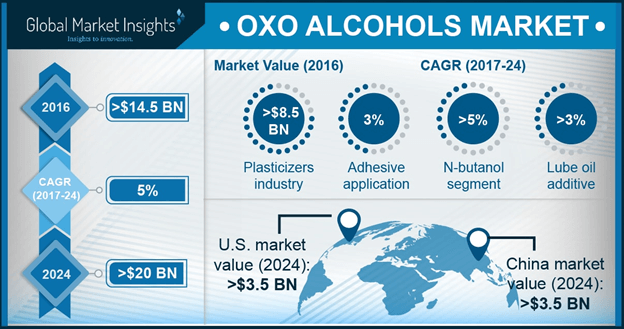 Oxo Alcohols Market Trends « Global Market Insights, Inc. The robust expansion of pivotal end-use domains such as packaging and construction will undoubtedly steer oxo alcohols market along a profitable growth path. With the demand for plasticizers observing an increase in the construction, consumer goods, and automotive sectors, oxo alcohols industry size is certain to increase in the ensuing years, given that these hydrogenated aldehydes are primarily used to manufacture plasticizers such as dibutyl phthalate and diiso-octyl phthalate. Despite the fact that this business sphere is essentially not a niche vertical, the product is extensively demanded from numerous end-use domains, thereby providing a slew of avenues for the growth of oxo alcohols industry. Pertaining to its widespread requirement, in tandem with the vast expanse of its deployment spectrum, oxo alcohols market size was pegged at USD 14.5 billion in 2016. As per estimates, global plasticizers industry size was valued at a massive 7.5 million tons in 2016 and is likely to depict an upward growth potential in the years ahead. This comes as no surprise, given how massively plasticizers are deployed in the polymer industry. When added to polymers, plasticizers apparently decrease the molecular attraction between polymeric chains, making them much more durable and flexible. With the increasing demand for polymer products such as PVC (polyvinyl chloride) products, ester-based plastics, plasticizer-based concrete, and more from the wiring, cabling, and flooring sectors, it would be profitable for investors to pour in their coffers in oxo alcohols market in the coming years. The plastic industry has been on a robust incline since the last decade, subject to the widespread product demand across a plethora of applications, which has been claimed to be a principal driving force behind the transformative oxo alcohols market outlook. In 2015, plastic production surpassed 322 million metric tons globally, 58 million metric tons out of which was manufactured in Europe alone. Driven by the profound deployment of plastics in the automotive, consumer goods, construction, packaging, and aerospace domains, plastic industry growth is slated to depict an extensive ascent in the years to come. By extension, oxo alcohols market size is also anticipated to exhibit a substantially huge growth rate, pertaining the fact that they are used massively for producing plasticizers, further deployed in plastic and polymer manufacturing. In fact, a report put together by Global Market Insights, Inc., states that oxo alcohols industry size from plasticizers will exceed a valuation of USD 8.5 billion by 2024. The commercial production of oxo alcohols involves intermediaries such as ethylene, propylene, and acetylene that are used to manufacture plasticizers, acetates, ether, and solvents. It is prudent to mention however, that these raw materials are essentially obtained from petrochemical based feedstock, indicating that any fluctuations in crude oil price and volume trends may have a direct influence on the revenue graph of oxo alcohols market. Companies partaking in oxo alcohols industry share have been focusing on improving their production capacity in order to combat the demand-supply gap. In consequence, oxo alcohols market, in recent years, has been ablaze with a slew of M&As, partnerships, and expansion deals. With companies shifting their base toward the South East Asian topographies for the reasons of lower production cost, in conjunction with the increasing product demand from the ever-growing automotive, packaging, and construction arenas, oxo alcohols market is certain to traverse a profitable growth map in the forthcoming years. This entry was posted in Bulk & Specialty Chemicals and tagged 2-Ethylhexanol, Acetate, Acrylate, Adhesives, Glycol Ether, Iso-Butanol, Lube Oil Additive, N-Butanol, Oxo Alcohols Market, Oxo Alcohols Market Forecast, Oxo Alcohols Market Growth, Oxo Alcohols Market Research, Oxo Alcohols Market Trends, Plasticizers, Solvents.